The NEW MERROW MG-2DFS-2!!! - Merrow Sewing Machine Co. The MG-2DFS-2 is an advanced sewing machine that has been introduced in 2011 to sew on today's technical fabrics. 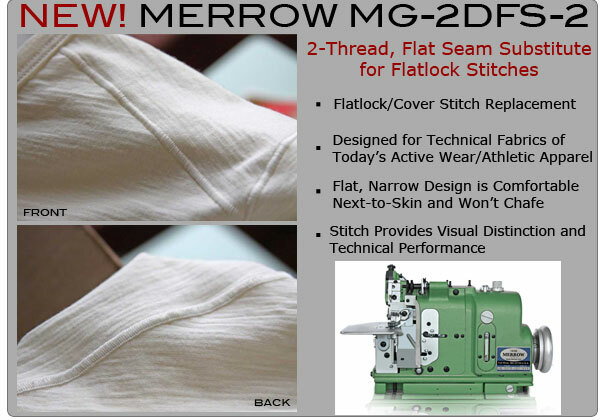 Built on Merrow's unique cam driven architecture, the FS-2 sews a flat seam that replaces conventional cover and flatlock stitching. At 1/8” in width and with a simple two-thread design, the stitch is as attractive and comfortable as it is functional, and is nearly imperceptible when worn on base layer garments that rest next to skin. For visual distinction and technical performance, the MG-2DFS-2 is the next advancement in technical sewing.